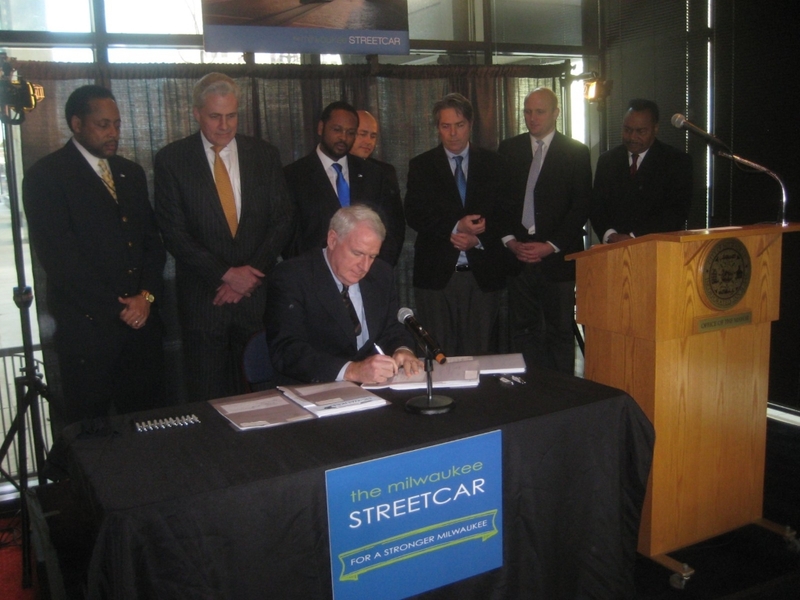 Mayor Barrett signs into law the Streetcar legislation. Photo by Michael Horne. The most debated public works project in the history of the City of Milwaukee was passed into law on Tuesday, February 10th, 2015 when Mayor Tom Barrett signed legislation authorizing the city to proceed with its 24-year old plan to develop a streetcar line. The mayor affixed his signature with a stationery store’s worth of pens which he handed out with abandon to commemorate the event. It was in 1991 that the city received its federal appropriation to construct a fixed rail transit system in Milwaukee. For over two decades the project has sustained AM talk radio station opposition, received support from forward-looking citizens and underwent over 40 Common Council committee hearings. The streetcar survived legislative meddling, a raid on a portion of its appropriation, a last-minute shadowy petition drive to force a referendum and a host of other indignities. Yet, nothing derailed the project, so it was in a celebratory mood that the doors of the Pabst Theater were opened to the public as the mayor signed the legislation just hours after it had (finally) garnered Common Council approval. The ceremony, attended by a host of urban and streetcar activists as well as supportive aldermen and others, was held in Cudahy’s Irish Pub in the Pabst, in full sight of where the old #10 streetcar line used to run. Among the attendees was 90-year old Michael J. Cudahy, the pub’s patron and namesake, who was a vociferous supporter of the project. While the others in the room snacked on fruit, pastries, cheese and sausage while sipping soft drinks, Pabst Theater boss Gary Witt materialized with a glass of Early Times Bourbon for Cudahy. Ald. Bob Bauman was one of the first to offer his remarks to Cudahy, who was sitting front and center for the signing ceremony. The mayor announced in his remarks that the project had been “fully debated.” The deed was done “in the middle of the day,” unlike so many controversial acts (particularly those of the legislature) that have taken place in the dead of the night. The streetcar legislation was a stand-alone measure, the mayor reminded the audience, and was not something “tacked on to a budget amendment,” another legislative specialty of the Scott Walker era. Now that Barrett has the financing to put shovels into the ground, he plans to get more money for the project. “I plan to be aggressive and assertive with the Federal government on financing,” he said. The mayor also hinted that he will also propose a city residence preference for workers on the project, receiving applause from the audience. Among the attendees was Rocky Marcoux, the Commissioner of the Department of City Development, who now has another tool in his arsenal to promote construction downtown. He was joined by Gary Grunau, a local developer who says he only has one unit left to sell at the Edge Condominiums on N. Commerce St. His Schlitz Park development downtown is now a magnet for young professionals who are a target audience of streetcar promoters and local real estate developers. Also in attendance was Rick Barrett, whose proposal for The Couture, a mixed use development downtown, was tied to the streetcar project. Revenues generated from the tax increment of The Couture (a key component of the streetcar legislation) will be used to help finance it. Some other developers and real estate interests with a stake in the outcome were not present at the event. Perhaps they were back at their offices jacking up the prices of the land they own along the streetcar’s right-of-way. Marcoux, Grunau and the mayor agreed with this reporter’s assessment that the mere signing of the bill will almost certainly have a positive effect on the value of properties adjacent to the streetcar line. In short order, the assessor will note this, too, as will City Treasurer Spencer Coggs, who was present, when he deposits their property tax checks. 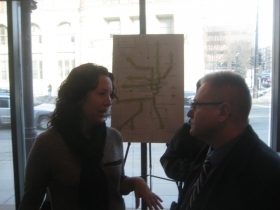 Beth Weirick of the downtown Business Improvement District stopped by to catch the action, and chatted with Grunau and others, including Kris Martinsek, a consultant who has kept up a steady stream of streetcar-related activities over the years. She was wearing a Milwaukee Streetcar T-Shirt. In his remarks, the mayor spread his thanks and recognition widely to the politicians, business leaders and others who supported the project, singling out for particular attention the work of this publication. He noted that in addition to the website’s exhaustive coverage of the issue, Urban Milwaukee: The Store has offered T-shirts like Martinsek’s for years. Also in the audience was Public Works Commissioner Ghassan Korban whose department will play a significant role in the construction of the project, including the relocation of underground utilities, the cost of which the city will be forced to bear, thanks to the project’s opponents. City Engineer Jeff Polenske was also in attendance. He gets to work out the details of the project with his staff. Pat Curley, the mayor’s chief of staff, also left his desk to appear at the historic event. Longtime transit supporter Joe Klein, who made the streetcar a key element in his long-shot primary race for County Executive against Scott Walker was also there with his wife, Mary Jo Klein. 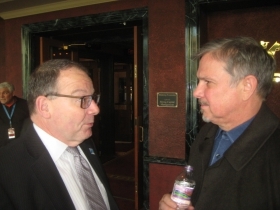 Bill Sell, a longtime supporter of transit projects in general, was there with Bruce Speight, the director since 2008 of the Wisconsin Public Interest Research Group. Not far away was Kevin Hardman, the director of the Bubblr Bike Share program here. 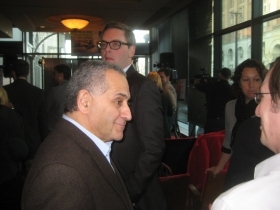 The mayor told Hardman that he will ensure that the streetcar will “dovetail” with the bike share program. County Board Chair Marina Dimitrijevic made an appearance, while County Executive Chris Abele did not. No complaints from either about that! 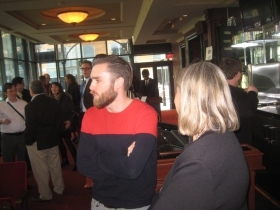 Jeremy Hooper, the graphic designer for the board of supervisors, also took in the proceedings. Six of the streetcar’s aldermanic supporters made the trek across N. Water St. from City Hall for the event. They were Willie Wade, Bauman, Ashanti Hamilton, Jose Perez, Nik Kovac and council president Michael Murphy. Also there was Grace Fuhr, the fiancee of Kovac, who announced her wedding plans. Nancy O’Keefe of the Historic Third Ward came by to show her support and to visit with the others. Julia Taylor was present at the signing. Her Greater Milwaukee Committee took no official position on the streetcar, nor did the Metropolitan Milwaukee Association of Commerce. Its head, Tim Sheehy, was not present. And now we are free to construct this vital urban amenity. You can say that all you want, but saying that it is “a historic day” would be the correct way. “a” before consonants, “an” before vowels. You can google it. I looked it up in The New Oxford American Dictionary, 2nd Edition (which comes bundled with Mac computers). “A MPD cop wears an uniform and belongs to an union”. The most debated public works project in the history of the City of Milwaukee was passed into law on Tuesday, February 10th, 2015 when Mayor Tom Barrett signed legislation authorizing the city to proceed with its 25-year old plan to develop a streetcar line. The mayor affixed his signature with a stationery store’s worth of pens which he handed out with abandon to commemorate the event. It was in 1990 that the city received its federal appropriation to construct a fixed rail transit system in Milwaukee. For over two decades the project has sustained AM talk radio station opposition, received support from forward-looking citizens and underwent over 40 Common Council committee hearings. •	It identifies 3 misguided African Americans – Spencer Coggs – Treasurer, Ashanti Hamilton – District 1, and Alderman Willie Wade, 7th District at the signing. In the gallery of phots, Wade is called Spencer Coggs. The population of African American is over 40% in Milwaukee. Where are they in your article? They brought the federal transportation funding. •	It identifies and praise front and center INSTITUTIONAL RACISM in the city of Milwaukee. •	It shows the ongoing, in-your-face, by-design SEGREGATION and DISCRIMINATION. •	It shows Caucasians laughing it up at the expense of CORE CONSTITUENTS of Milwaukee as evident by “who are not celebrating” – African American, other People of Color and the Work Challenged – the ones that brought the money to the city of Milwaukee; and, the folk that will jumpstart the 20 plus year TID(s) for the Rick Barrett Couture $2,300 average rent project (seen at the celebration). The folk in need of transportation to in-and-out of the city employment and jump-start revenue zones. •	It speaks to how Mayor Barrett and like-minds were able to twist-arms and call-in markers. •	It speaks to Tom Barrett, mayor, scoring a victory in DIVISIVENESS and winning BAIT-N-SWITCH – IT WILL NOT PLAY WELL now or in 2016. •	It speaks to Barrett’s monopoly-oligopoly cronies’ take-over – GMC Julie Taylor, Gary Grunau, Michael Cudahy, Beth Weick, Kevin Hardman and others. •	It speaks to vetting the positions of support of Bill Sell and Bruce Speight to the CORE CONSTITUENTS of the city of Milwaukee and Milwaukee County Transit. •	It says some individuals (Tim Sheehy, Chris Abele and others) that were not present are looking at the Bucks Center , north of Bradley Center and not wanting to alienate – just saying. 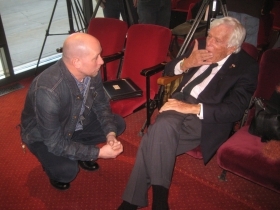 •	It gives Michael Cudahy an opportunity to host the event at the Pabst Theater, Cudahy’s Irish Pub – The $1.00 gift (Pabst Theater) to him by the city of Milwaukee. •	It speaks to Alderman Bob Bauman, CC President Michael Murphy, Alderman Jose Perez, and Alderman Nik Kovac sell-out of the CORE CONSTITUENTS. •	It says the People must be in touch with the federal government in transportation and the U.S. Justice Department – review of laws, regs and by all means look to 2016 Change of Guard. •	It says that the People should run and walk fast to sign the Referendum for Direct Legislation. It asks if you, Mr. Horne, represents an extension for the public relations for Tom Barrett’s office? As one of the individuals/organizations that mounted the Class-Action suit over 20 years ago for the transportation funding, I do not consider this a DONE-DEAL and the celebration is premature. It is really in bad taste with the real history being what it is for the need of Transportation for the CORE CONSTITUENTS in the city of Milwaukee using public transportation. Ok Mary…… we all know what you don’t like, but why don’t you tell us what public transportation in Milwaukee and the region should look like. But don’t stop there, how should our regional system be funded? Oh Mary!! Where are you? 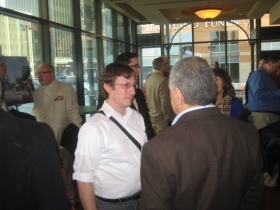 I have someone you should meet… his name is Bob and he’s the editor of Wisconsin Conservative Digest. You guys have a lot in common.